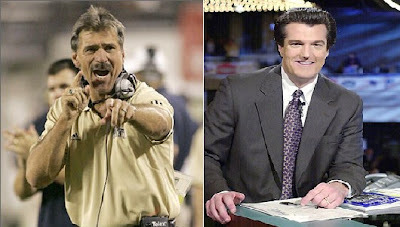 By a margin of 48-37, the Stache out-projected Mel Kiper. If only I could have his perfectly coiffed hair. In actuality, you could say my first round projection was the best on the Internet. My score of 48 would have placed me squarely at the top of the standings all by myself. So much for the so-called "experts." Shocked over the pick at first, because I never envisioned the thought of him being available. He'll lengthen Parker's career, and be an outstanding compliment to him. Down the road, he'll be a feature back. I had wanted Quentin Groves, who Jacksonville traded one spot ahead of us to take, but Sweed is a damn nice consolation price. The tall receiver Ben has clamored for, he'll be the #3 or #4 guy this season, and eventually will team up with Holmes as the one-two punch when Ward calls it quits. An offense consisting of Ben, Parker, Mendenhall, Holmes, Ward, Sweed, and Miller. Talk about explosive. The sheer number of weapons alone will hopefully cause defenses to think twice about blitzing, which as a byproduct should help out the pass protection. Oft-injured, but if he can stay healthy he seems to have the tools to become a decent left tackle. Potential Heisman candidate before his injury. If he's not completely healthy by the start of the season, I could envision a scenario where he is placed on IR in his first season, allowing him time to recover physically while assimilating the offense. By Year 3, hopefully he'll be the #2 QB. The other two picks, Humpal and Mundy, seem like they could be solid special teamers. That's fine by me. We've seen the trouble on special teams. Anything else they could provide would be gravy. Yeah, I gotta say I impressed myself. Although I totally missed on Groves. He didn't even go until the 2nd round, and from what I read in the PG, even if he were still on the board the Steelers wouldn't have taken him with their 2nd round pick. I realize this has nothing to do with the Draft, but just a few thoughts on Game 3 at the start of the 2nd period. First and foremost, props to Hossa for essentially saying 'f*ck you' to ron cook and his article earlier today just one minute and 2 seconds into the game (http://www.post-gazette.com/pg/08120/877437-87.stm). I love to see that from a guy who has a following of doubters. Also, I think Jagr deserves a little credit here. Perhaps my memory is short, but I haven't see him this passionate on the ice since leaving Pittsburgh for DC.